The Nissan Navara is the name for the D22, D40 and D23 generations of Nissan pickup trucks sold in Asia, Europe, South Africa, New Zealand and Australia. In North, Central and South America and some selected markets, it is sold as the Nissan Frontier or Nissan NP300. The D22 line began in 1997, replacing the model D21 compact pickup. After more than 10 years with the D21, Nissan unveiled the similar sized D22. It was replaced with the bigger, taller, longer D40 mid-size pickup. In 2014, Nissan released its successor, the D23, for international markets other than Canada and the U.S. The Navara gets its name from the Navarre region of northern Spain. The European version is built at the Nissan factory in Barcelona. The D22 is a compact size pick up truck manufactured from 1997 to 2004. However, Nissan continued to build the D22 as a cheaper alternative to the D40 in many markets. Originally planned to follow the D21 Hard Body in being designed by Nissan Design International in La Jolla, CA, design of the D22 was reluctantly given to Japan during the 1994–1995 period. This was due to NDI being busy with many design projects of for concepts and models, such as the Quest (VX54 II), Altima (L30), and Maxima (A32.5). Design of an updated D22 was eventually given to NDI in 1998. In North America, it was built in Tennessee from 1997 to 2000 as the Nissan Frontier. Versions: Single cab, King Cab, Crew Cab (Introduced in 1999). Engines: Petrol (KA24DE) and Diesel (TD27) (2wd and 4wd) with 5 speed manual transmission. These models were also exported to Central and South America. US production in Tennessee started in 1997 with a Single cab and a King cab. A four-door version of the D22 was designed and developed during 1997–1998, being first produced in April 1999 and launched in May 1999 in the US as the 2000 Frontier Crew Cab. In 1999, a special edition was offered. Nissan called it the Desert Runner. It had a king cab base but on the 4X4 frame which gave it a boost in ride height, bigger tires and a 4- or 5-speed 2WD drivetrain. For 2001 the Desert Runner got a new look and a supercharged version of the V6 engine. In 2005 the V6 VQ40DE was added. Standard on all Crew Cabs through current 2018. In February 2000 at the Chicago Auto Show, Nissan introduced a facelifted D22 Frontier for 2001, with bolder styling in an effort to make it more appealing to younger buyers in its second generation. The D22 Frontier was completely redone after the 2004 model year, which later resulted in the discontinuation of the regular cab model. Sales and production started in North America, with Crew Cab and King Cab versions and new grille, bumper, headlights, taillights. Other body changes included built in fender flares and tailgates. The D22s badged as "Frontier" had different grille, tailgate details and interior in contrast to the D22s badged as "Navara". The D22 was no longer sold in Japan after 2002. Due to incompatible taxation rules and plummeting popularity of pickup trucks in Japan, Nissan discontinued it in their home market with no replacement afterwards, a fate shared by many of its competitors there. The Egyptian plant exports to the Middle East, and a South African plant to African countries. Mexican production started in 2008: D22 truck Single Cab Chassis and Long Bed (2WD or 4WD, 2.4-liter petrol or diesel), Crew Cab (2WD and petrol) called the D22 Pick up. In 2009 the D22 was updated with redesigned exterior door handles. In June 2017, Peugeot announced to produce the Peugeot Pick-Up for Northern African states. It is equipped with a 2.5-litre inline 4 turbodiesel, 86 kW (115 hp), 280 N⋅m (207 lb⋅ft), manual 5-speed transmission, rear wheel drive or all-wheel drive, with optional gear reduction. It is a badge engineering version of the DongFeng Rich, which has a partnership with PSA. It comes as a Crew Cab (5 passengers) Short Bed (1,40 m x 1,39 m bed) version (5,08 m in length) with a payload of 815 kg. Market introduction started in September 2017. For the Australian market, the D22 Navara ran as a series 1 from the end of the D21 until 2001, when a series 2 was released with a new ZD30 Diesel engine and updated front end. The ZD30 powered D22's were exceptionally reliable unlike the Patrol counterparts, but were replaced in 2008 with an upgraded Common Rail 2.5L Diesel engine. The D22 Navara was run in parallel with the larger D40 until 2015. Both were replaced by the D23 Navara - locally known as the NP300 Navara as of 2015. The Brazilian Nissan plant started production around 2002 (Crew Cab Diesel 2WD or 4WD, five-speed manual, or single cab 2WD diesel. Only for Mexican market: petrol 2.4-liter manufactured in Mexico) and it was exported to Argentina (all Brazilian versions) and Mexico (Crew Cab, petrol 2.4-liter, 2WD, five-speed manual). Nissan Bolivia imported from Japan the Nissan Frontier D22 Crew Cab, 2.4-liter petrol or diesel, 4WD. Imported from Mexico, the D22 Crew Cab and single cab long bed, petrol 2WD. Some Frontiers were gray imported from the USA. These were V6 with automatic transmission for private importers. In Chile, the D22 was marketed as the "Nissan Terrano" (a name previously used in the WD21 SUV) due to KIA Motors already using the "Frontier" moniker in its Bongo minivan series. It was sold from 1998 to 2014 and according to the National Automobile Association of Chile it was the most sold automobile in 2010. The facelifted "Navara" version arrived in 2003, in 2.4L petrol, 2.5L turbo diesel, 3.0L turbo diesel and 3.2L diesel. Even with the unveiling of the D40 Navara in 2008, it continued to be sold as a cheaper and more work-oriented alternative, outselling the D40. Starting in 2012, all D22 models were imported from Mexico replacing the Japanese model's injection pump with a common rail fuel-injection system, among other changes and the 3.0L and 3.2L models were discontinued. The D22 was replaced by the Nissan D23 "NP300" in 2015. STD Standard model. Black plastic bumpers, grill, hood scoop and mirrors, 1-din stereo, 2 speakers, manual windows. 14x5J steel rims with 185R14 tires. Manual locking hubs. DX: Same characteristics as STD, but sightly taller, narrower loadbed. Including side mudguards. 6-J-16 steelrims with 205R16 tires. DXS: Same characteristics as DX, including ABS brakes, air conditioning, double air-bag, body-colored hood scoop. AX: Body-colored hood scoop and bumpers, chromed grill, side steps, electric windows, 7-JJ-16 steel rims with 255/70R16 tires, double airbag, air conditioning, ABS brakes, 1-DIN CD Stereo with 4 speakers. AXS: Same characteristics as AX, including ABS brakes, double DIN 6 CD-loader stereo with 4 speakers, chromed electric mirrors, 7-JJ-16 alloy rims with 255/70R16 tires. Optional sunroof. Automatic locking hubs. Nissan first offered the D22 with a 4-cylinder engine, the KA24DE, but added the V6 engine, the VG33E in 1999. In Australia the D22 had the KA24E till 1999, then changed to KA24DE option that year, a 3.0L V6 was introduced in June 2000. In February 2003, 4x4 models received a larger 3.3L V6 (available only with a 5-speed manual), while 4x2 models continued with the 3.0L V6 (with manual or automatic transmissions). The V6 was dropped in 2005, leaving the 2.5L turbo diesel as the only available engine. The first series of D22s had larger (QD32) 3.2-litre normally aspirated Diesel engines producing 75 kW. It also had a (NA20S) 2.0 litre petrol sohc 8 valve engine producing 75 kW. SOHC V6 (VG33E) 3.3 L (201 CID) 170 hp (127 kW) 200 lb⋅ft (271 N⋅m) Available in a V6 Supercharged version. 2010-2011 Facelift Nissan D22 Navara DX regular cab (Australia). Note: updated exterior door handles from 2009 onwards. Initially, the Frontier was considered a compact, but beginning with the totally redesigned model year 2005 Frontier (introduced at the 2004 North American International Auto Show), it became more mid-sized (as did rival Toyota Tacoma for this model year). It uses the new Nissan F-Alpha platform and exterior body styling resembles that of the company's full-size Nissan Titan truck. In 2012 production was shifted from Smyrna, Tennessee to Canton, Mississippi. The new truck has a fully boxed ladder frame. The wheelbase is 125.9 in (3.20 m) with a 205.5 in (5.22 m) overall length. Towing capacity is 6500 lb (2,950 kg). A 4.0 Liter VQ-family V6, the VQ40DE, is the standard engine, and it produces 261 hp (195 kW) and 281 lb⋅ft (381 N⋅m) of torque. Also available is the QR25DE four-cylinder engine, which is also found in the Nissan Altima. It produces 152 hp (113 kW) and 171 lb⋅ft (232 N⋅m) of torque. A six-speed manual is standard with a five-speed automatic optional. Both rear and four-wheel drive are available. Traction control and hill-descent control are also available. The Frontier is called Navara when sold in Europe. The engine is a 2.5 L YD25DDTi diesel, with 142 hp (106 kW) or 172 hp (128 kW). The stronger version has 403 N⋅m (297 lb⋅ft) of torque. Nissan of Bolivia imports the D40 and D22. 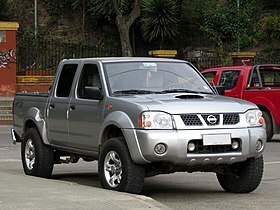 Sourced from Japan are the Nissan Frontier D-22 Crew Cab 4x4 and from Mexico the D-22 Crew Cab and single cab long bed 4x2. Nissan of Bolivia imports a Nissan Navara D40 Crew Cab as well. Some Frontier D40s are imported from the United States with a V6 and automatic transmission. Suzuki sold a Frontier-based mid-sized pickup produced by Nissan North America at the Smyrna plant. The truck debuted at the 2008 Chicago Auto Show as the Suzuki Equator. For 2009 the Frontier received a face lift with more options, colors, and new wheels. The Nismo model was replaced by the PRO-4X model. Suzuki discontinued the Equator in 2013, as part of the shutdown of their American passenger car division. Sales of the PRO-4X model continue in Mexico. In 2014 Nissan released a concept truck with a 2.8-liter Inline-four engine Cummins Diesel engine paired with a ZF 8HP transmission. The Navara in Europe came with an updated Euro IV compliant engine on post September 2006 vehicles. It has four trim levels, the S, SE, Outlaw and Aventura. The Aventura trim package is equipped with leather upholstery, dual zone climate control, six-stacker CD/MP3 changer and satellite navigation as standard. In Australia, New Zealand and South Africa, the D40 Navara has a few differences from the UK versions. There are two engines available, 2.5-liter turbocharged diesel engine and the V6 petrol. The diesel engine in 4WD models produces 128 kW (172 hp) at 4000 rpm and 403 N⋅m (297 lb⋅ft) at 2000 rpm, with the 2WD models producing less at 106 kW (142 hp) at 4000 rpm and 356 N⋅m (263 lb⋅ft) at 2000 rpm. The V6 produces 198 kW (266 hp) at 5600 rpm of power and 385 N⋅m (284 lb⋅ft) at 4000 rpm. Both engines come with a standard five-speed automatic, with a six-speed manual available for the diesel. These models do not have leather, climate control or satellite navigation system like their UK versions. The 2008 model of the Navara was launched on 2 July. Changes included a new style of alloy wheels, bluetooth as standard, side work lights and indicators on the wing mirrors. The 2008 Single Cab became available in Thailand 6 March. The 2.5-liter engine reduces the torque output from 356 N⋅m (263 ft⋅lbf) to 294 N⋅m (217 ft⋅lbf) at 2,000 rpm. This model has 15-inch wheels. Power steering is standard. Also available are electric mirrors and central power locking as optional extra. Nissan planned to sell the single cab and began to export worldwide at the same month. Nissan also continues to sell the D22 pickups with minor updates for a lower price (now called as Frontier LCV). The Nissan Navara Double Cab became available in Malaysia on 5 November 2008. It is available with a 2.5-liter diesel engine producing 128 kW (172 hp) and 403 N⋅m (297 ft⋅lbf), only with a five-speed automatic. A year later the six-speed manual version became available. The D22 series Nissan Frontier remains on sale in Malaysia with a manual transmission. In November 2008 Nissan Thailand Released the all new Nissan Navara Calibre with a 144 PS (106 kW) at 4000 rpm 36.3 kg·m (356 N·m; 263 ft·lbf) at 2000 rpm available with a five-speed automatic or a six-speed manual transmission. For North American Frontiers model year 2009, and European Navaras model year 2010, Nissan updated the shape of some minor components. The 2010 Nissan Navara facelift are now powered by a new 3.0-litre V9X V6 turbodiesel engine producing 240 hp (175 kW) and 369 lb-ft (500 Nm) at 2,500 rpm and a revised 2.5-litre dCi unit (YD25DDTi High Power). The 2011 Nissan Navara and Pathfinder facelift V6 develop 170 kW (231 PS) and 550 N⋅m (406 lb⋅ft) of torque between 1,700 rpm and 2,500 rpm and the famous YD engine which produces 190 PS (140 kW) and 450 N⋅m (332 lb⋅ft) of torque and the VQ40DE remains the same with the 261 hp (195 kW) at 5600 rpm; 281 lb⋅ft (381 N⋅m) at 4000 rpm. There are subtle changes to the headlights and the bonnet. The V-shaped grille shell is less pronounced and the bumper is rounder and projects 80 mm further forward, but the six-spoke 17-inch alloy wheels or optional 18-inch alloy wheels are the biggest change. Inside the new Navara (top of the line model), Nissan designers have specified softer materials of a better quality for the dash, seats and interior moulds. The centre console and fascia designs have been revised, as have the instrument binnacle layout and door trims. Additional bright/gloss finish surfacing is used throughout the cabin. The six-stack CD audio system or the TV Navigation entertainment console is upgraded with speed-sensing volume, MP3 compatibility and Bluetooth connectivity for the (six disc CD audio system). Other new or revised features include dual-zone climate control, remote audio/Bluetooth/trip computer controls on the steering wheel, trip computer, external temperature gauge, speed-sensitive variable windscreen wipers and 'follow me home' lighting. The electric mirrors now fold in fully for car washes or parking in narrow spaces. Importantly, the upgraded Navara (diesel only) gains stability control, which Nissan calls Vehicle Dynamics Control and all petrol V6 and diesel variants gain side-impact and side-curtain airbags to complement the dual front airbags. The car receives good rating in Frontal Offset Test, Side Impact, and Roof Test by IIHS but only Acceptable in rear impact. It has issues with rust that can make it split in half under some conditions. 2010 Nissan Frontier received the U.S. National Highway Traffic Safety Administration's Highest Side-impact Safety Rating (5 stars). 2010 Nissan Frontier Received J.D. Power and Associates Highest Ranked Midsize Pickup in Initial Quality Award. On 11 June 2014, Nissan unveiled the third generation Navara, codenamed the D23 and released as the NP300 Navara. Series production commenced at a new $360 million plant in Samut Prakan, Thailand in July 2014 and deliveries began in August. The D23 is not be available in the US or Canada. A Nissan North America spokesperson stated that the D23 is not indicative of a D40 Frontier replacement. The European model will feature a 2.3-litre engine from the Nissan NV400. After the release of the D23, which is only available with 4-cylinder engines, the D40 remained on production only with the V6 and automatic transmission. For the 2018 model year, the Navara is equipped with Nissan Intelligent Mobility technology which include an Around View Monitor and a blind-spot monitoring system. The EnGuard concept is a modified D23 Navara pitched directly towards emergency rescue organisations. Unveiled at the 2016 Hannover Motor Show, the concept is notable for being the first prototype with a Nissan designed and developed portable battery pack. Other features that cater for rescue organisations include an onboard DJI Phantom 4 drone, an increased ride height, strobe lights and a fully adjustable suspension system. On 25 October 2016 Mercedes-Benz revealed 2 concept pickup trucks previewing the upcoming joint-built Pickup Model, to be called "X-Class". The X-Class will be based on the platform of the current NP300 Navara and will be built at plants such as in Spain (Barcelona) and in Argentina (Cordoba). Renault revealed the production version of the Alaskan Pickup Concept which will be based on the current Navara platform. The Alaskan was shown alongside other Renault Models at the 2016 Paris Motor Show in October. According to some journalists it has not yet been confirmed if the Alaskan will be sold outside of Europe. From October 2016, the Alaskan is sold in Colombia. 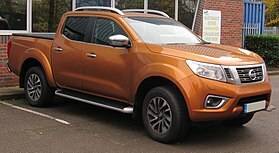 The Frontier is known as Nissan Navara in most of Europe, Australia, New Zealand, Jamaica, and South Africa and Nissan Terrano in Chile (only the D40 series is known as Navara) and NP300. It is currently built in the United States, Spain (alongside the Mercedes-Benz X-Class), South Africa, Thailand, China, Malaysia, Mexico (alongside the Renault Alaskan), Argentina and Egypt. The D40 Frontier platform is currently being used as a Stage Rally vehicle by the NISMO Stuff Racing effort currently competing in the Coupe Rallye Quebec series. This team has been racing the current D40 Frontier for over two years with eight stage rallies and two hill climbs under its belt having never suffered a mechanical failure of any kind. Nissan South Africa campaigned both the D22 and D40 platforms very successfully in the local ABSA Off-Road Series, winning eight consecutive driver's championships (2001 to 2008). The vehicles were prepared by Hallspeed South Africa. Hallspeed also developed and sold vehicles to the Belgian-based company Overdrive. For several years Overdrive have competed with the Hallspeed built vehicles in the European rally Raid series, including The Dakar. ^ a b c แกะรอยกระบะนิสสัน (4) ปิดตำนานบิ๊กเอ็ม (in Thai). Manager Online. 20 May 2007. Retrieved 2 June 2011. ^ "Fiat. Fiat in South Africa". Car-cat.com. Retrieved 16 July 2010. ^ "Nissan. Nissan in Malaysia". Car-cat.com. Retrieved 25 July 2010. ^ "Nissan. Nissan in Egypt". Car-cat.com. Retrieved 25 July 2010. ^ ":: Giad Automotive Industry Co. Ltd. (Holding Company) :: GIAD Vehicles Co. Ltd". Giadauto.com. Archived from the original on 26 November 2010. Retrieved 24 November 2010. ^ "1999 Nissan Frontier King Cab". WHEELS.ca. Retrieved 15 July 2015. ^ "PickupTruck.Com – Road Test: 2000 Nissan Frontier Crew Cab". Retrieved 15 July 2015. ^ "Nissan Vehicle History". Nissan USA. Retrieved 15 July 2015. ^ "Nissan Terrano es el auto más vendido del año 2010, según Anac". La Segunda. Retrieved 23 May 2018. ^ ยุทธพงษ์ ภาษี (5 February 2007). "ลองรถ "ขอบคุณ" นิสสัน นาวารา 4WD (ตอน1)" (in Thai). กรุงเทพธุรกิจ (Krungthep Turakij). Archived from the original on 29 February 2012. Retrieved 27 August 2010. ^ "Frontier Pro 4x Nissan México". www.nissan.com.mx. Retrieved 30 April 2018. ^ "Nissan Frontier Cummins Diesel". Retrieved 6 February 2014. ^ Tan, Paul (5 November 2008). "Nissan Navara with 174 PS launched in Malaysia". Paultan.org. Retrieved 8 November 2010. ^ "2014 Nissan Frontier Truck". Nissan USA. Retrieved 25 February 2014. ^ "2011 Nissan Frontier | Awards & Reviews". Nissan USA. Retrieved 8 November 2010. ^ "2011 Nissan Frontier | Awards & Reviews". Nissan USA. Retrieved 22 April 2011. ^ "Nissan officially unveils new Navara". Retrieved 15 July 2015. ^ "Nissan Posts Teaser for New Pickup on Instagram – News – Car and Driver - Car and Driver Blog". Retrieved 15 July 2015. ^ Brandon Turkus. "Nissan reveals NP300 Navara pickup, is it the next Frontier? [w/videos] [UPDATE]". Autoblog. Retrieved 15 July 2015. ^ "2016 Nissan Navara unveiled". ^ "2018 Nissan Navara launched with Intelligent Mobility tech - Auto Industry News". AutoIndustriya.com. 9 February 2018. Retrieved 15 October 2018. ^ a b "Nissan Navara EnGuard Concept (2016)". Retrieved 25 September 2016. ^ a b "Nissan Navara EnGuard Concept". www.deeptread.com. Deep Tread. Retrieved 25 September 2016. ^ "Strong South African Nissan Presence in 2009 Dakar Rally | Nissan South Africa". Nissan.co.za. Archived from the original on 1 March 2014. Retrieved 25 February 2014. ^ iwcweb. "Overdrive Racing – palmares". Overdriveracing.be. Retrieved 25 February 2014. ^ "Thailand cars sales report 2014". HeadlightMag.com. Thailand. Retrieved 24 October 2018. ^ "Thailand cars sales report 2015". HeadlightMag.com. Thailand. Retrieved 24 October 2018. ^ "Thailand cars sales report 2016". HeadlightMag.com. Thailand. Retrieved 24 October 2018. ^ "Thailand cars sales report 2017". HeadlightMag.com. Thailand. Retrieved 24 October 2018. ^ "Thailand pick-up sales report 2018". HeadlightMag.com (in Thai). Thailand. Retrieved 22 January 2019. Wikimedia Commons has media related to Nissan Frontier.